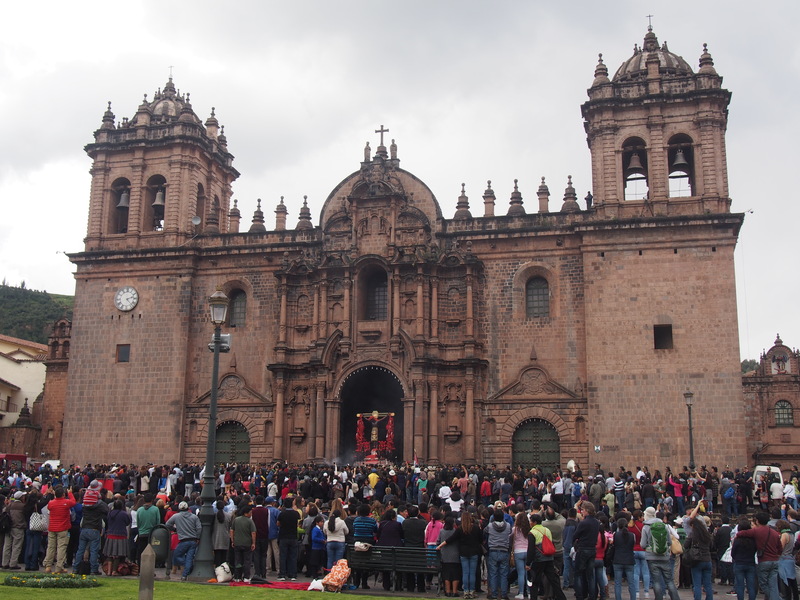 There are a million things to do in Cusco and surroundings. You can easily spent two weeks here. It is a beautiful colonial city. 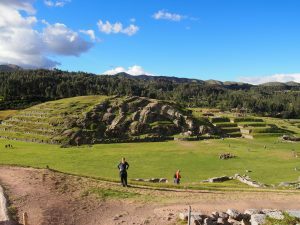 We spent one week here including our three days at Machu Picchu. 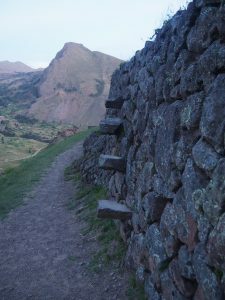 But as the starting point for trips to Machu Picchu, it also has a downside. 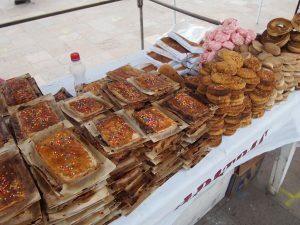 It is full of tourists and people try to sell you everything. We walked through the streets of Cusco forever, and you can easily get lost. But most of our highlights were outside the city. 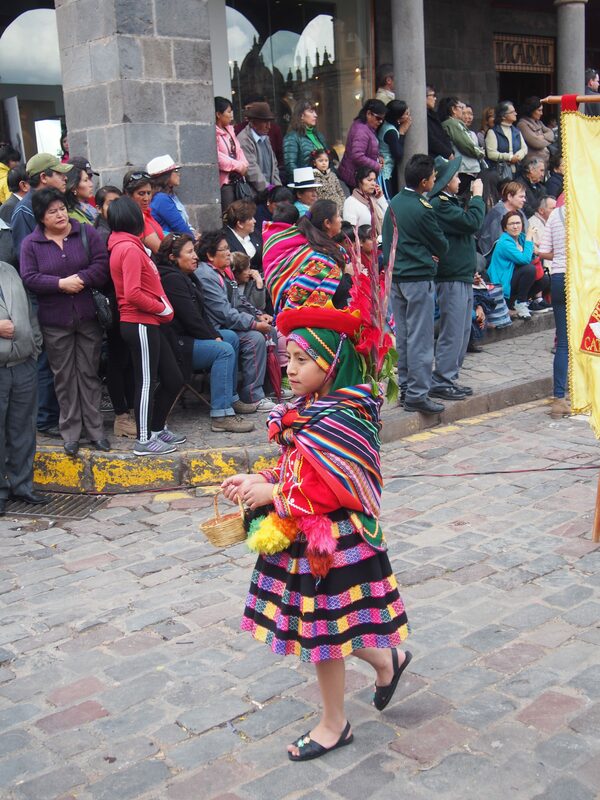 We were in Cusco during Semana Santa (easter week). 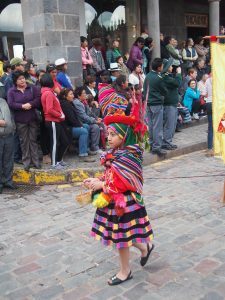 We had planned to go to Ayacucho, because it is supposed to have the best celebrations. 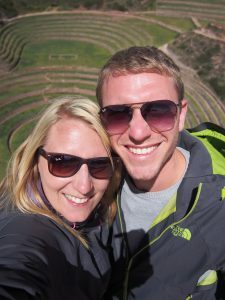 Unfortunately all hotels were booked when we checked one week before. We were a bit disappointed then. However, we found out that Cusco was also a nice place for easter processions. 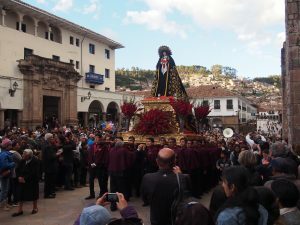 On palm sunday Jesus on a cross was carried out of the main cathedral on Plaza de Armas in a long procession. It carried on all afternoon until the night. The poor guys carrying the statue definitely had a hard job. 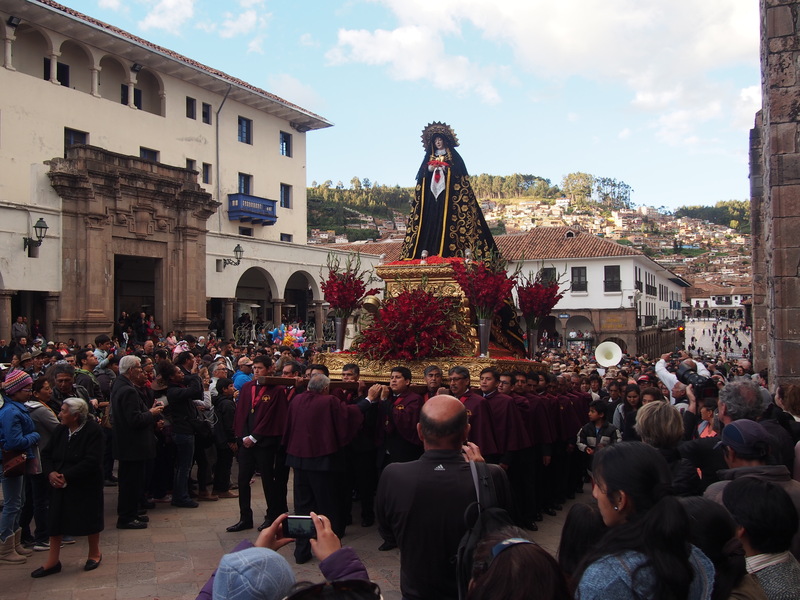 On Good Friday we witnessed another procession, but this time we didn´t stay too long. 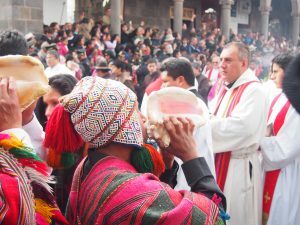 For us it was impressive to see how easter is celebrated here. The church was full and all seats were taken. 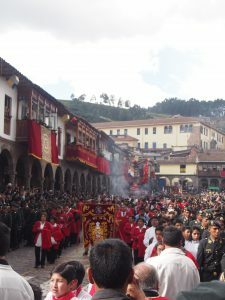 Everyone participated in the procession on the street. 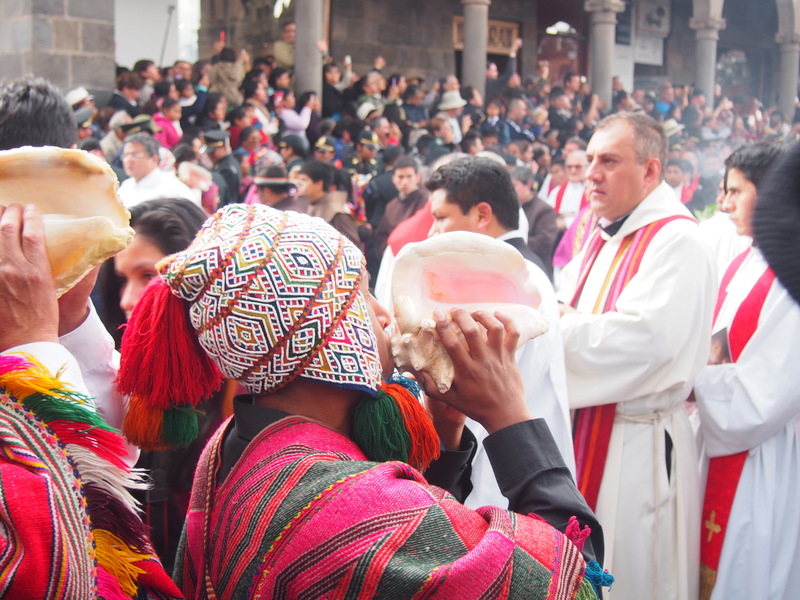 In Germany, the church would be happy if half as many people would join the mass. 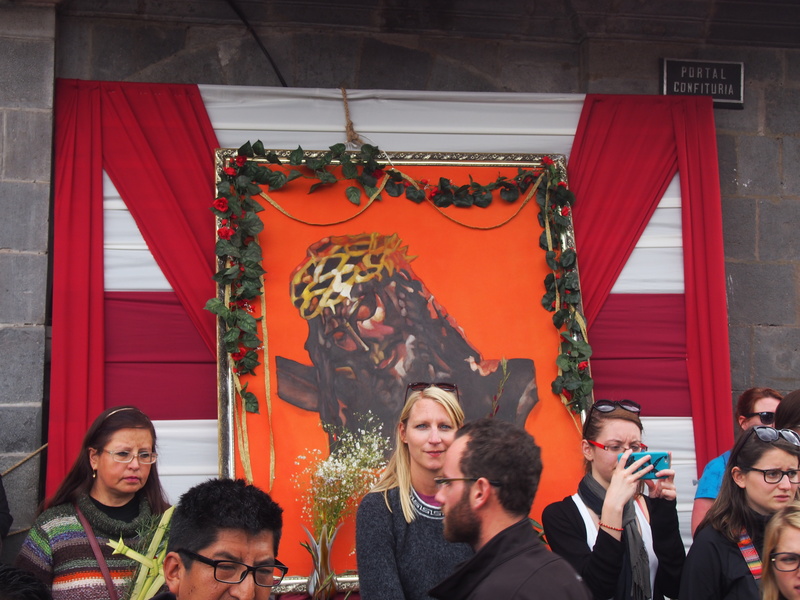 The atmosphere was much more captivating than in any German church. Not to forget: The delicious Semana Santa cookies! 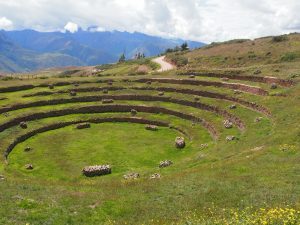 The ruins closest to Cusco are often sold in a half day „city tour“. 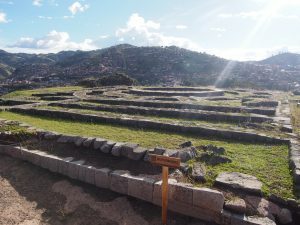 Since we don´t like tours, we took a local bus to the furthest one, Tambomachay, and walked the 8 km back into the city, visiting all sites on the way. Tambomachay consists of aqueducts and canals that run through the terraced rock. 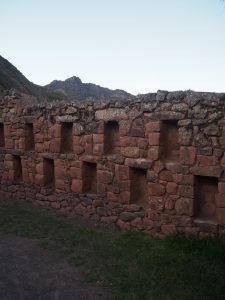 It is believed it was used as a spa in inca times. The water is still running today. The next place was Puca Pucara just across the street of Tambomachay. 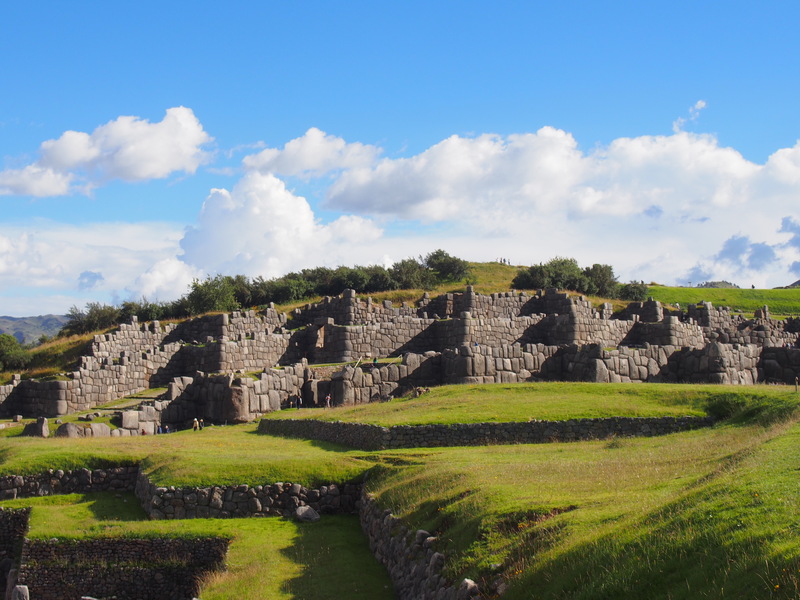 It is believed that this one had been a military structure. 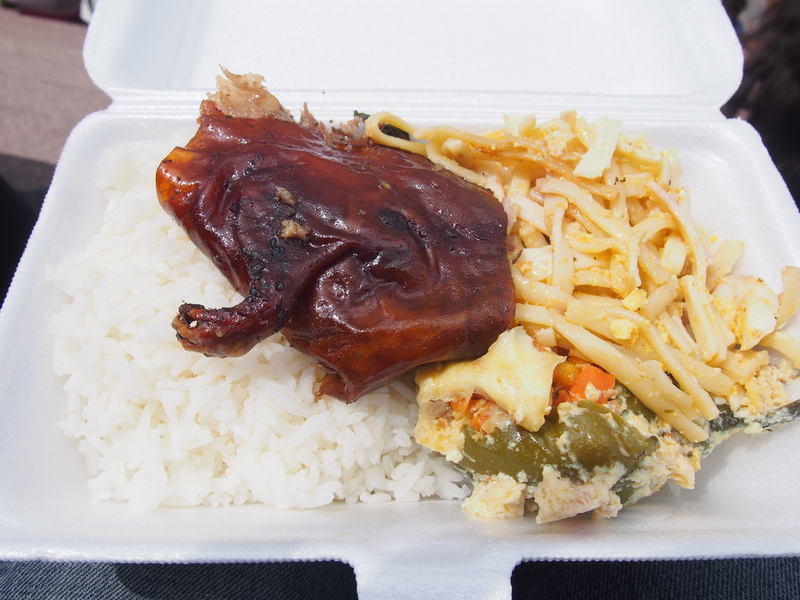 After a 5km downhill walk you make it to Qenqo. 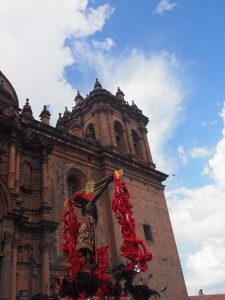 It was a religious place for sacrifices and mummifications. The most important ruin in this area is Sacsayhuamán. 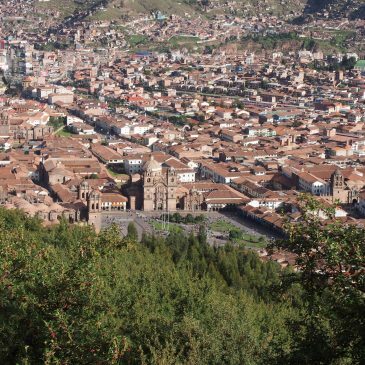 You need to understand that the incas built Cusco in form of a puma. The body consisted of the houses around Plaza de Armas, with the plaza itself as the heart. 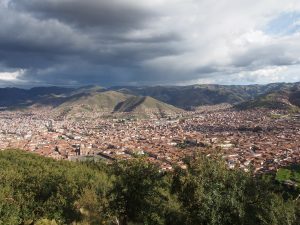 The tail was the spot where the two rivers of the city unite. And the head was the fortress on a high plateau in the north of the city – Sacsayhuamán. 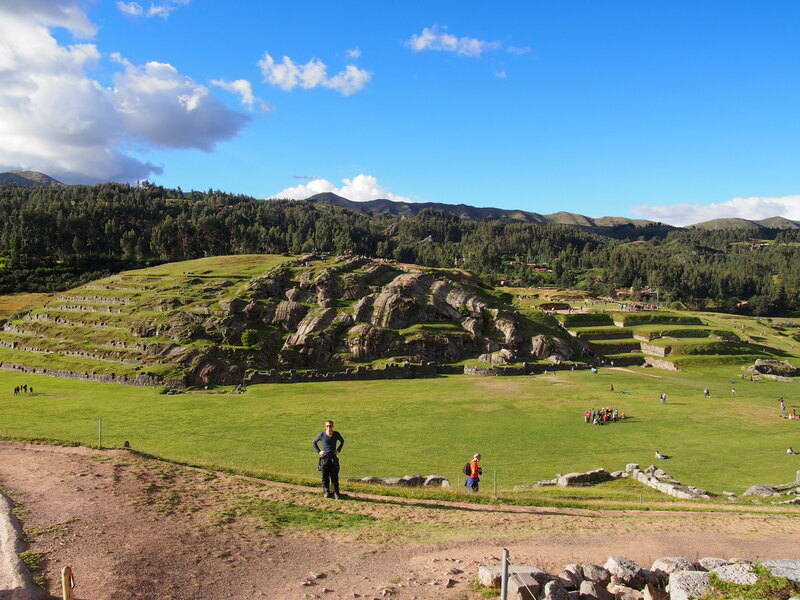 The site became historically important because it was the place of the last battle of the Spanish and the Incas. 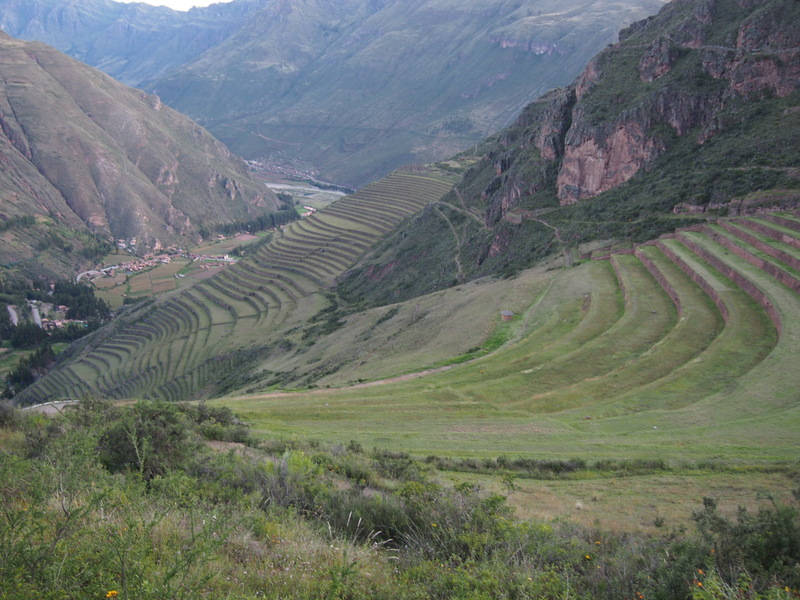 The incas were defeated here. To visit the Sacred Valley we went on a day tour, because it was the only way to see everything in one day. 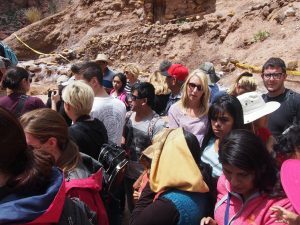 Magically we appeared in a different group then the booked one, so we got a two-day tour in one long and exhausting day. 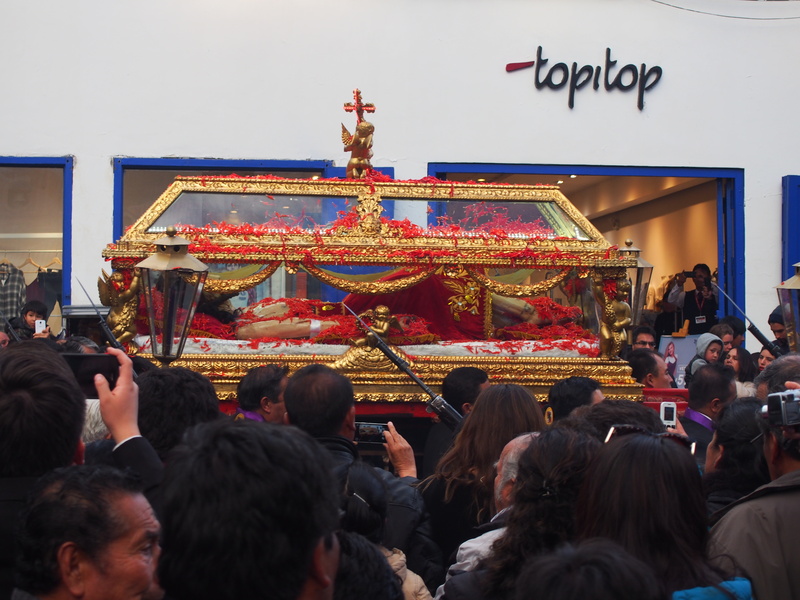 Part of all these tours is visiting shops, that nobody wants to go to. So our tour started at a local shop for handcrafts, where they explained how the alpaca wool is processed. 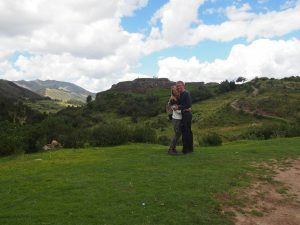 Our first interesting stop was the ruin of Chinchero, the former country residence of a Inca king. It is a good example of how the Spanish destroyed the Inca culture. 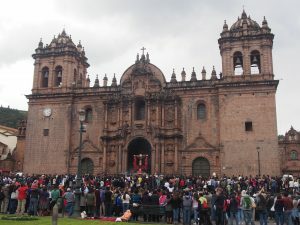 They knocked down the palace and built a church at the place. Only about 20% of the original place is left. 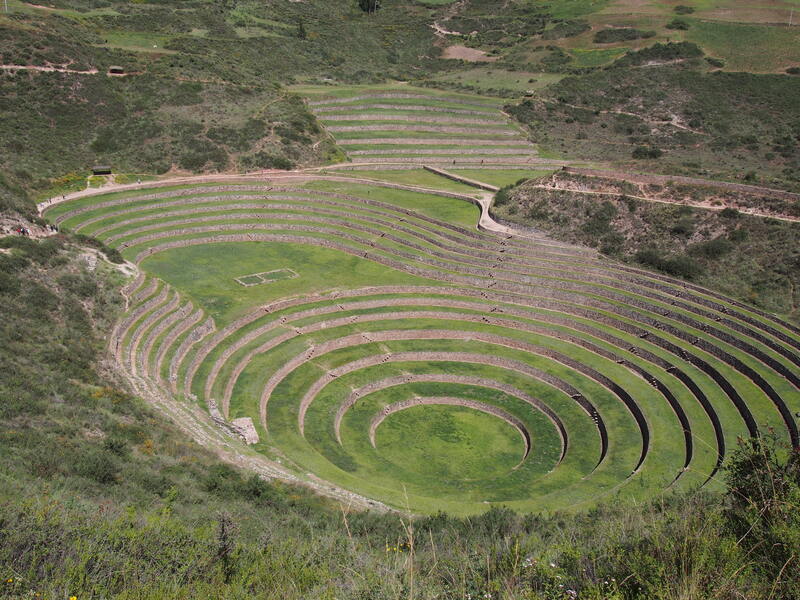 Next, we went to a really interesting place – Moray. 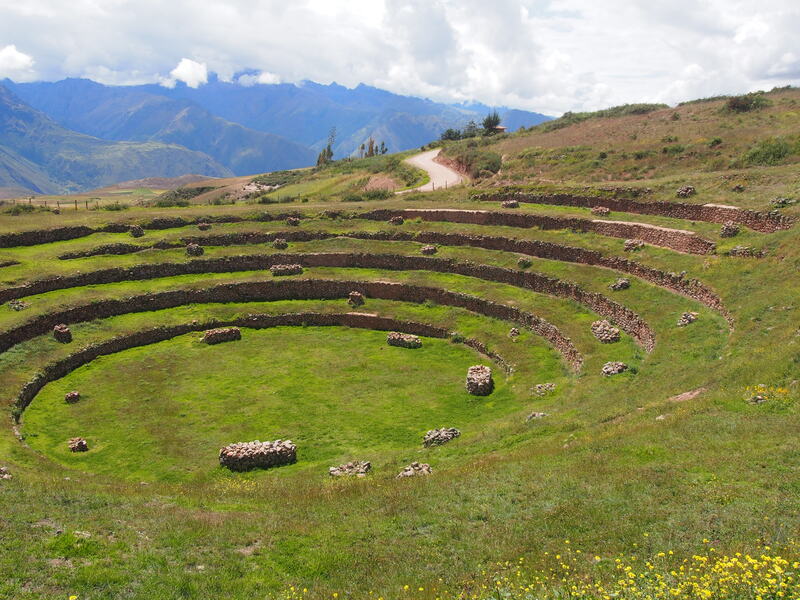 It was a agricultural laboratory of the incas. On each terrace, they cultivated different plants. 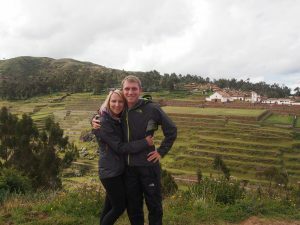 The temperatures differ by up to 5 degrees on each terrace. 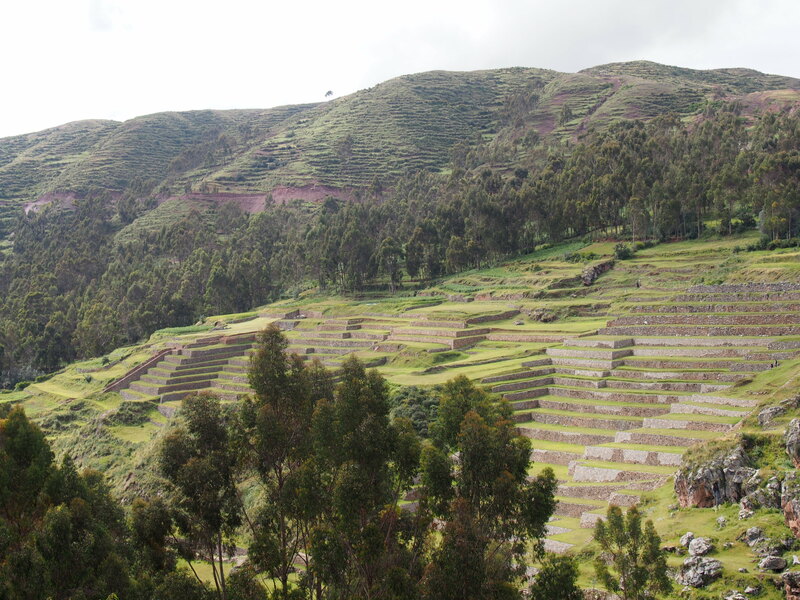 For example, the incas had 4.000 types of potatoes. 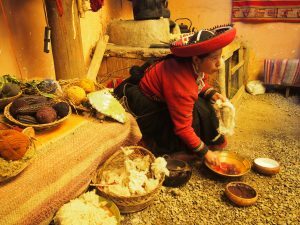 They crossbred different seeds to find the best breeds to cultivate. 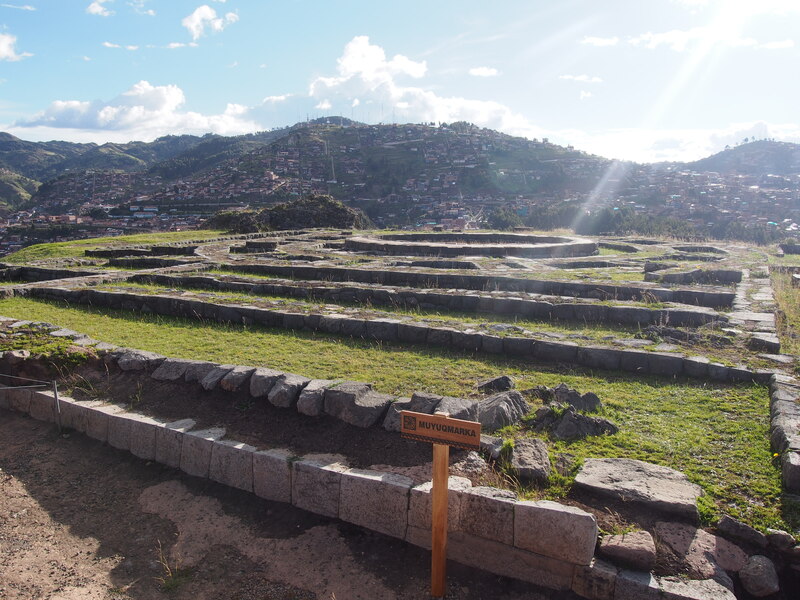 The seeds from this laboratory were sent to different places in the inca empire for cultivation. 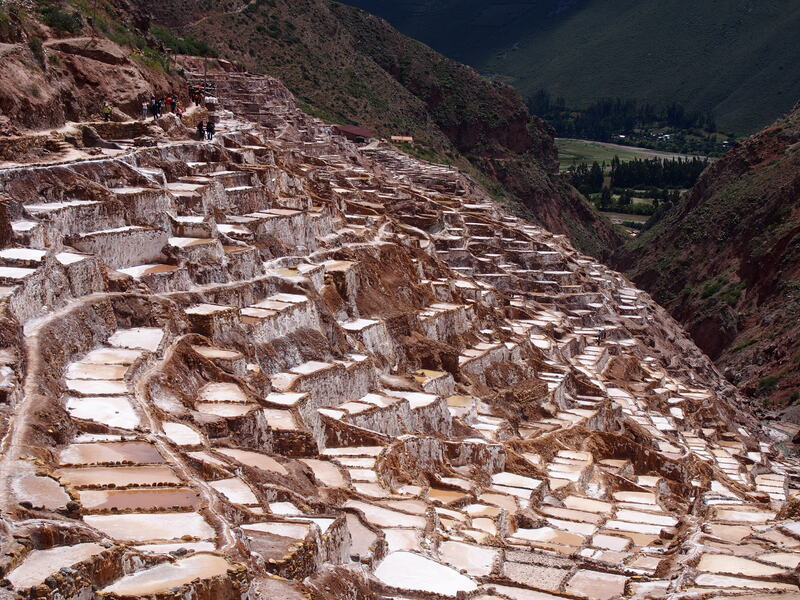 Our next stop was Salineras de Maras. 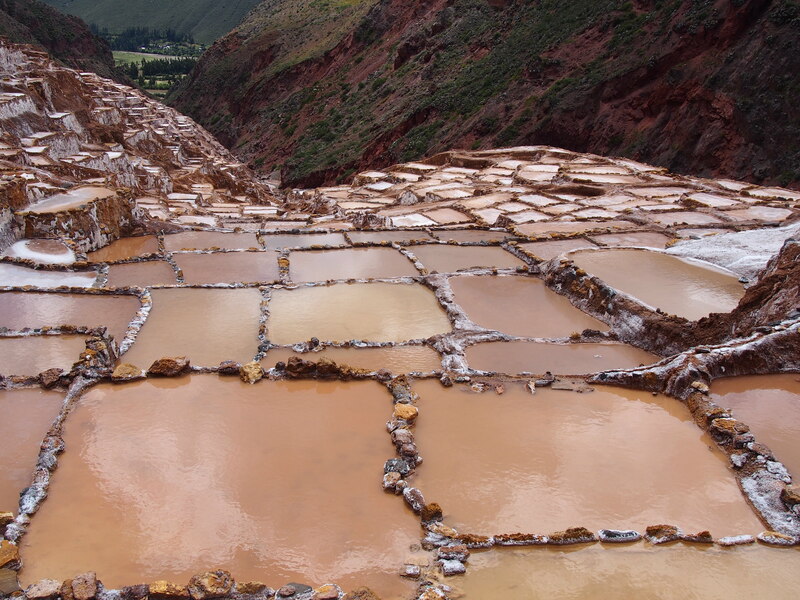 This place consists of about 4.000 salt evaporation pools, in use since inca times. 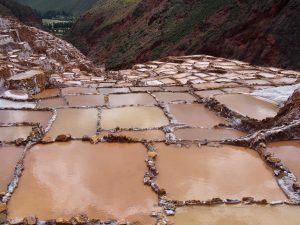 There is a local subterranean stream of highly salted water. The water emerges at a spring and is directed into a system of small channels, filling up the 4.000 pools. 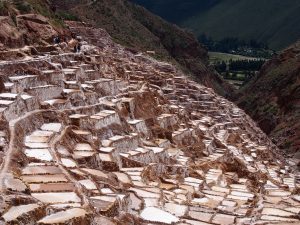 Today, each pool is owned by one person who extracts the salt. Can you see how much we love these crowded tours? 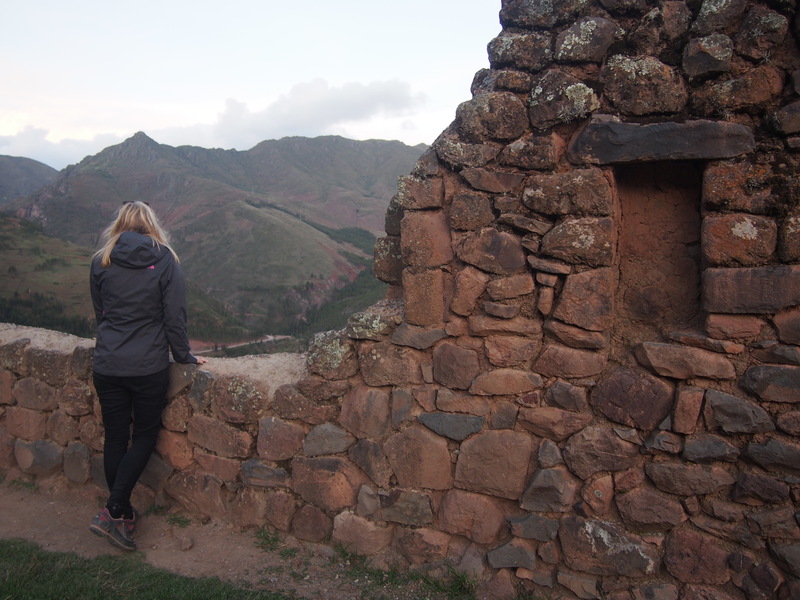 After an already long day we made it to one of the best ruins in the Sacred Valley – Ollantaytambo. 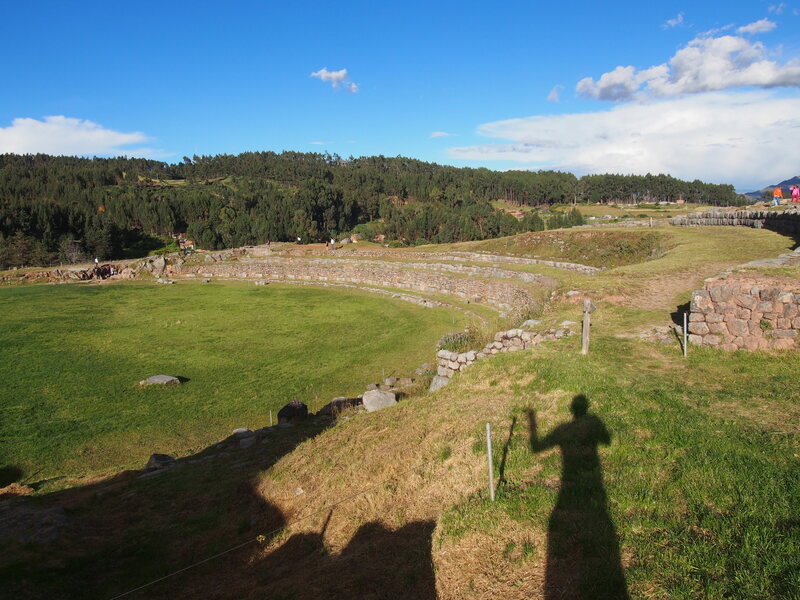 This impressive site had never been finished due to the arrival of the Spanish. The incas had tried to built a sun temple here. 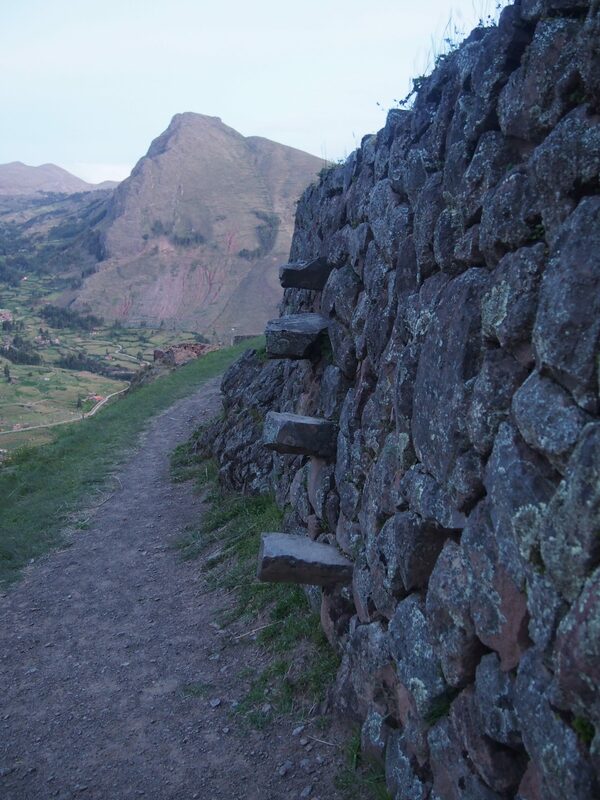 It is believed that many astronomists lived here. In the mountain opposite the sun temple they carved a face. On each 21st of June, the beginning of winter, the sun rises and shines right through the eye of this man, shining onto the sun temple. We found this really impressive. 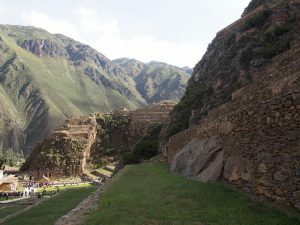 The incas stopped building the temple when the Spanish came to prepare for the war. In fact, they even won the war at Ollantaytambo. 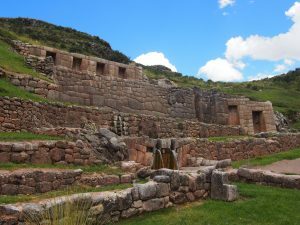 But when the war was lost at Sacsayhuamán, the incas were defeated. Unfortunately we only had one hour at this site. 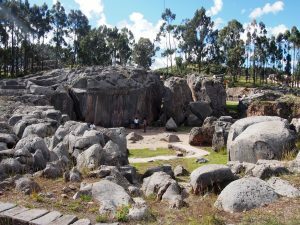 We are sure that you can easily spent a whole day here, climbing up the two mountains and exploring all parts of the site. Our last stop was the ruins of Pisac. Unfortunately we were too late to enter the site. 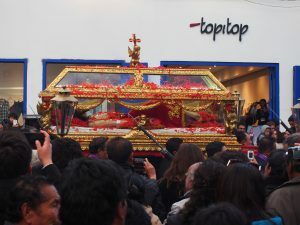 This was because we had to stop at too many shops and the day was too packed. 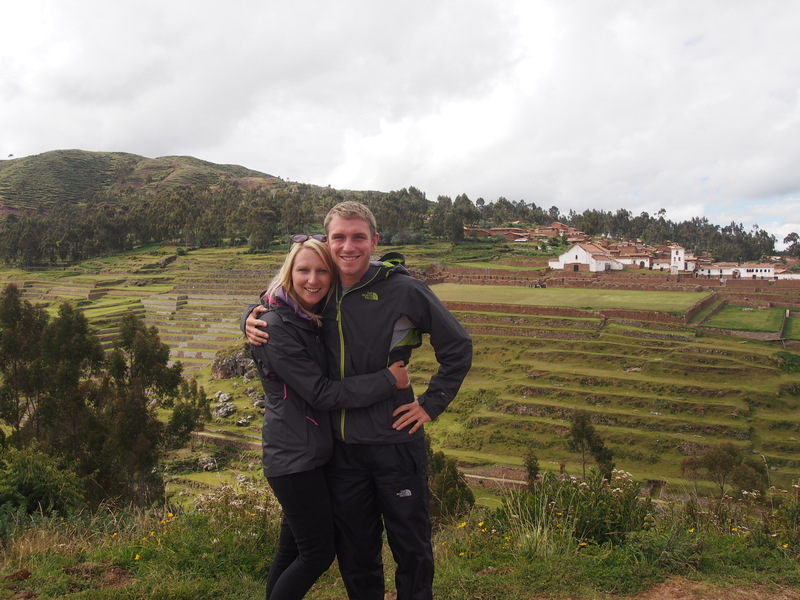 We were disappointed that we couldn´t explore Pisac properly, there is a lot to see. 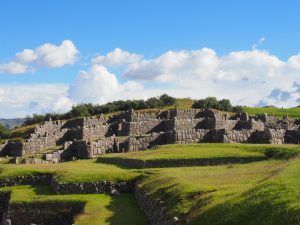 It includes military, religious and architectural structures. After another unnecessary stop at a jewellry shop we got back home after a long 12 hour day. 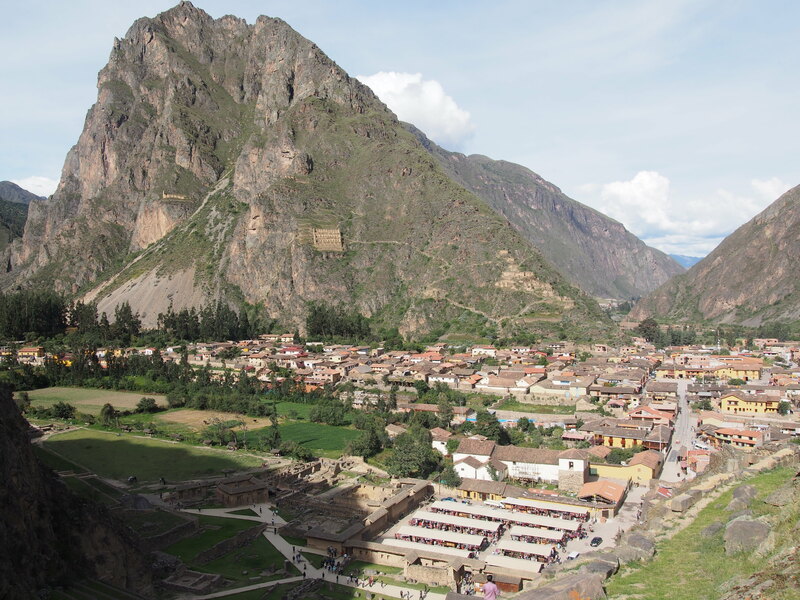 Our recommendation for the Sacred Valley is the following: Take an early morning bus (45 minutes) and spend a day at Pisac. 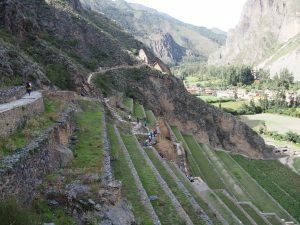 Stay the night and then go on to Ollantaytambo for another day. 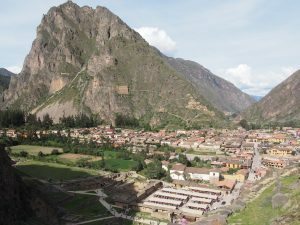 From here, you can take a bus or train towards Aguas Calientes (Machu Picchu). 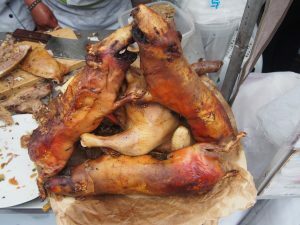 You can easily get a guide there, do not go for the horrible and long guided tour. 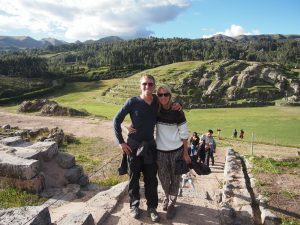 You will miss the best parts of these two sites! After one week in Cusco and two awful tours (Valle Sagrado and Rainbow Mountain), we were ready to leave to a place where nobody cares about us or doesn´t want to sell anything. We were also looking forward to doing things on our own again. 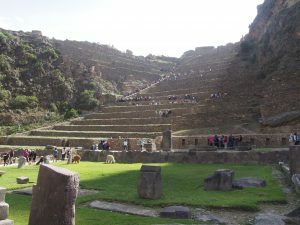 However, Cusco is definitely worth the visit and a must for any Inca ruin you plan to visit.